Cheap - but at what cost? 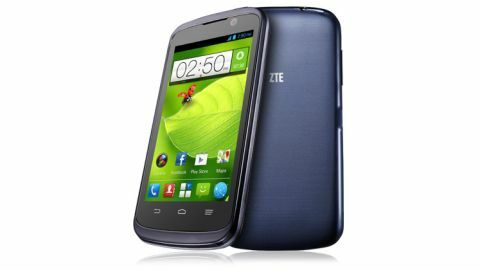 It's the best ZTE phone yet, although that isn't saying much as previous phones were pretty dreadful. It's a decent enough cheap handset, but despite the quad-core processor it felt underpowered. The camera is atrocious and there's precious little storage space. There is much that can be said about the ZTE Blade V, the price and the quad-core processor. It almost singlehandedly proves that rise of the budget smartphone can't be ignored. Varying international markets, a global recession and a rise in smartphone-buying teens mean that demand for cheaper smartphones has never been higher. Firms such as Chinese brands Huawei and ZTE have now become synonymous with low spec low cost devices, with Samsung's Galaxy range of smartphones attacking every single area of the market. At just over £80, locked to Virgin Mobile, the ZTE Blade V is clearly pitched towards the very budget conscious, ideal for those that want a cheap smartphone to take to school. This means it has some decent competition, with the Nokia Lumia 520, Samsung Galaxy Fame and the Huawei Ascend Y300 helping to pack out an incredibly competitive market. Has the Chinese firm given the Blade V enough to fight it out and shine against the competition? With the price being so low, there have been some obvious cut backs, obvious being the optimal word there. Don't go expecting the latest version of Android, although the ZTE Blade V does come packing Android 4.1 Jelly Bean. In all, a reasonable start. The design of nigh on every smartphone, all but the odd BlackBerry, that hits the market is dominated by the screen. On the face of the Blade V is a 4-inch IPS screen, with a 480x800 resolution. You almost get the feel that ZTE has tried to beat the Samsung Galaxy Round and LG G Flex to market with a flexi screen of its own, but the reality is that it is just the way the screen sits poorly in the chassis. Running your finger from top to bottom gives a definite flex in the screen, giving the ZTE Blade V a really cheap feel. The plastic casing also gives a cheaper feel, but with the low price we didn't expect the premium feel of the aluminium HTC One. The screen is noticeably low resolution as well, but given that you only get 4GB of internal storage (less with OS), we don't see there being a lot of desire to watch HD movies on the Blade V.
Now we come to the kicker. That 1.2GHz quad-core processor. Yes, quad-core. While it doesn't match the 1.6GHz chips found in older handsets like the Samsung Galaxy S3, given competitors are running 1GHz single and dual-core insides, the added size is something we can see really appealing to consumers. These multiple cores are backed up with 1GB of RAM to help ease the strain, reducing any excessive battery drain associated with the multiple cores. Other key specifications include a 5MP rear camera for those funky playground shots, and a VGA front facing camera for those profile pictures. We've heard that sparrow faces are the latest craze. As mentioned, there is only 4GB of storage. This can be expanded with the inclusion of a microSD card, with the ZTE Blade V supporting cards of up to 32GB. In terms of buttons, there are the three standard Android soft keys sat beneath the screen, meaning that the Back, Home and Menu buttons aren't on screen affairs. The volume rocker is sat on the top left, fairly flush to the Blade V, although still providing enough of a raise to be easily located and pressed. The power/lock button is on the top. Thankfully, the smaller size of the ZTE Blade V means that all buttons were easy enough to hit one handed. The ZTE Blade V also has all the regular ports, with the microUSB say halfway up on the left and the 3.5mm headphone port on the top, leaving both the bottom and left hand side of the device free. Behind the removable back cover sits a 1800mAh battery, the SIM port and the microSD port. It's a little fiddly to get the card in and out, but we were pleased to find that it was hot swappable. In all, it is clear to see where all the focus of the ZTE Blade V is going to sit, slap bang on that large processor/small price combination. Initial impressions elsewhere reflect the cost cutting measures involved in making the ZTE sub £100.